Yesterday I spent many hours in the car on a trip from Wales to Wigan to pick up our new puppy. Yay. This meant little real food and less cooking. Today we eat. I made up yesterday a pot of my own style bolognese which is a household favourite. Today I am making some hopefully amazing puffs to serve with it. I’m not entirely sure what ‘puffs’ are but they have a vast amount of cheese in them so it’s all good with me. The recipe didn’t mention what sort of flour to use so I opted for plain. It didn’t turn out too bad really. The recipe is good as it’s pretty low on steps but does require some speed with the eggs and flour into a hot liquid situation. 1. 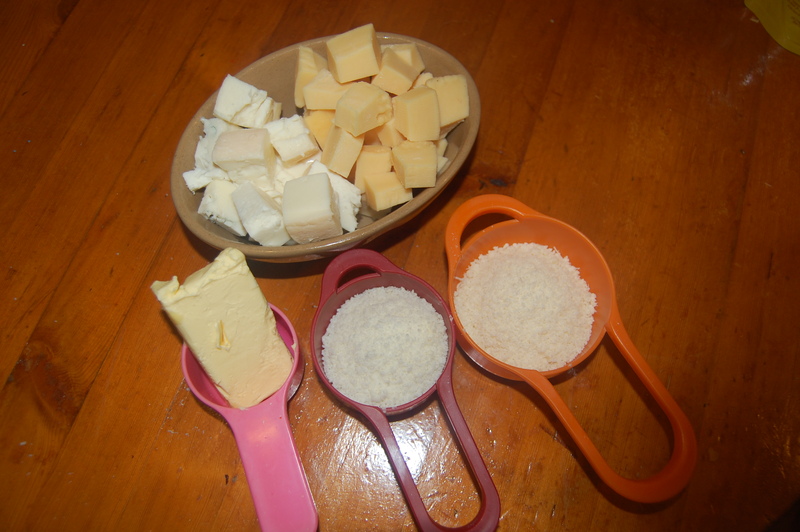 In a saucepan combine the milk, 1/4 cup of water, butter and salt. Bring to the boil over a high heat. 2. 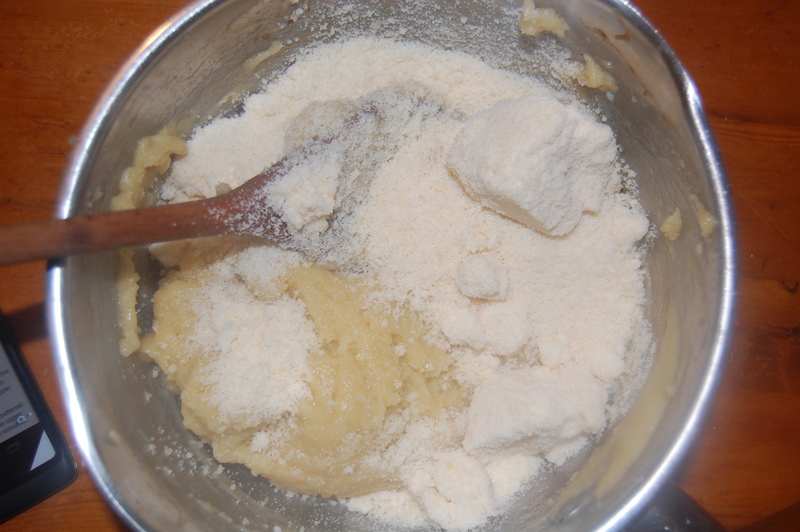 Once boiling reduce to a medium heat and add the flour in one go, beating it in until the mixture forms a ball. 3. Remove from the heat. Stir in the eggs one at a time. 4. Add the parmesan and pepper to taste. 5. 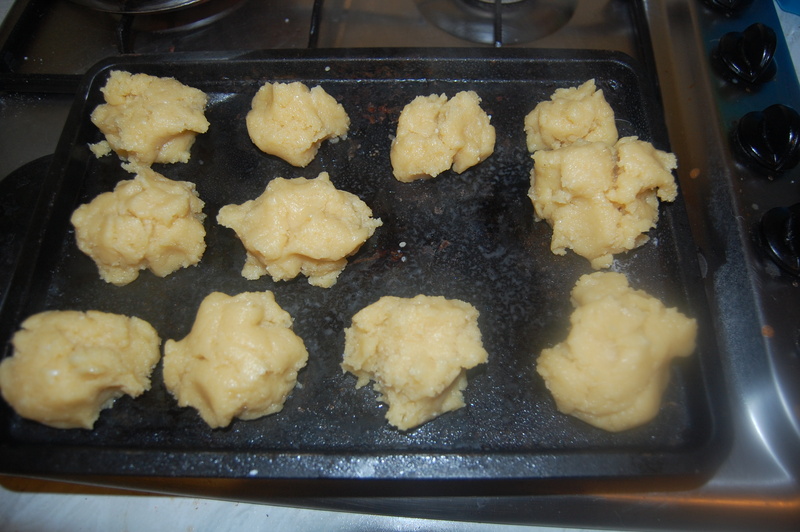 Form mix in to balls and place on a buttered baking tray. Cook for 20-25 minutes at 180 or until puffed up and golden, turning half way through so they cook evenly. 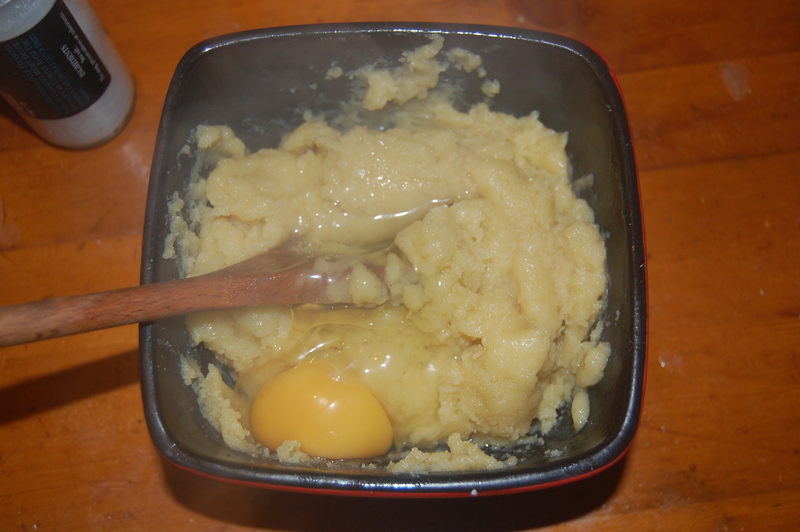 I have to admit to trying some of the ‘batter’ left over after the balls were made. It was beyond cheesy and rather salty – I normally salt everything but this was a little too much for even me. Luckily this didn’t remain in the finished ‘puffs’. So that’s what a Parmesan Puff looks like. 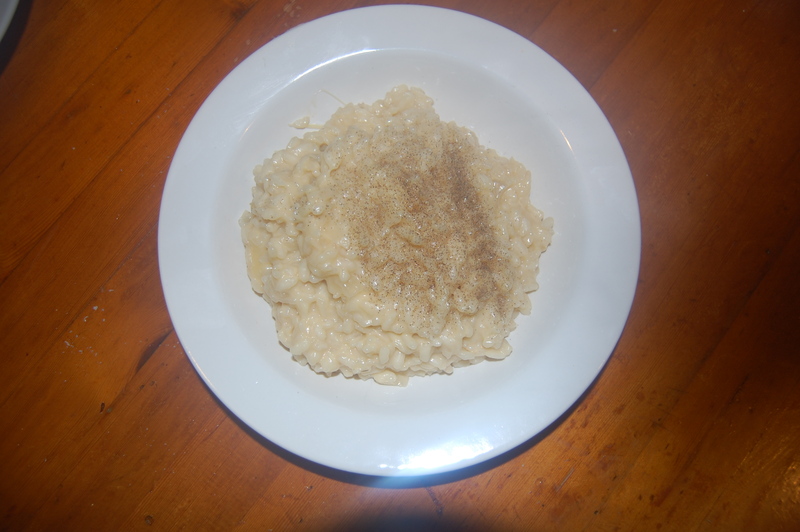 TASTE – Cheesy, bit greasy but possibly doubled the butter by accident. 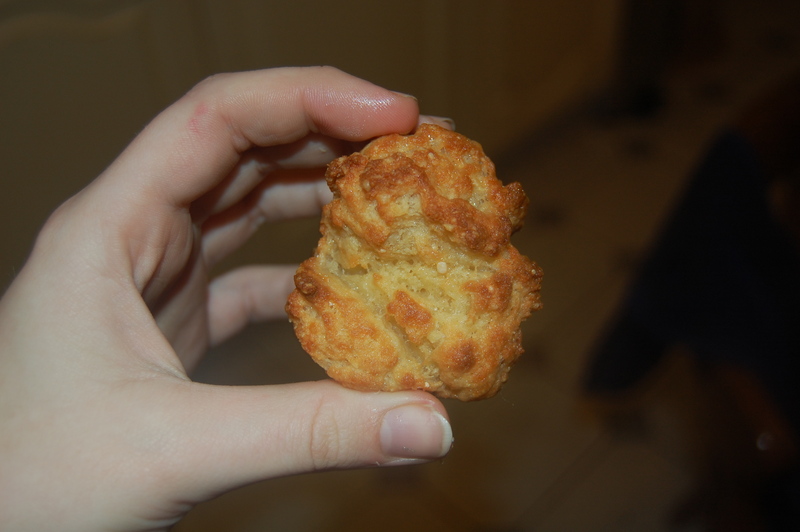 Bit like a cheese scone. Came out a little doughy so I don’t necessarily agree with the cooking times. DIFFICULTY – Simple. Bit faffy having to swap bowls all the time though. Would do it all in the one dish next time. And reduce butter. 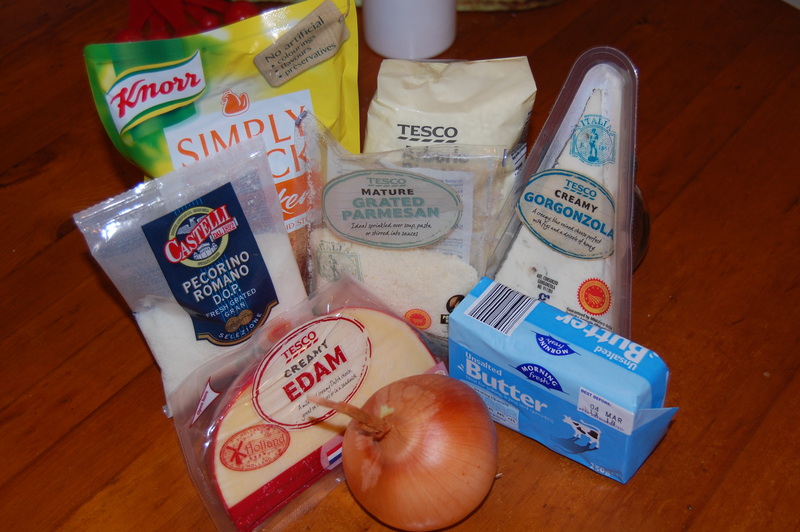 COST – Cheese was dear at 2 quid but the rest was super cheap basic brands. If there is one thing you should know about me and food it’s this. All cheese, any cheese. White, blue, hard, soft, all cheese. 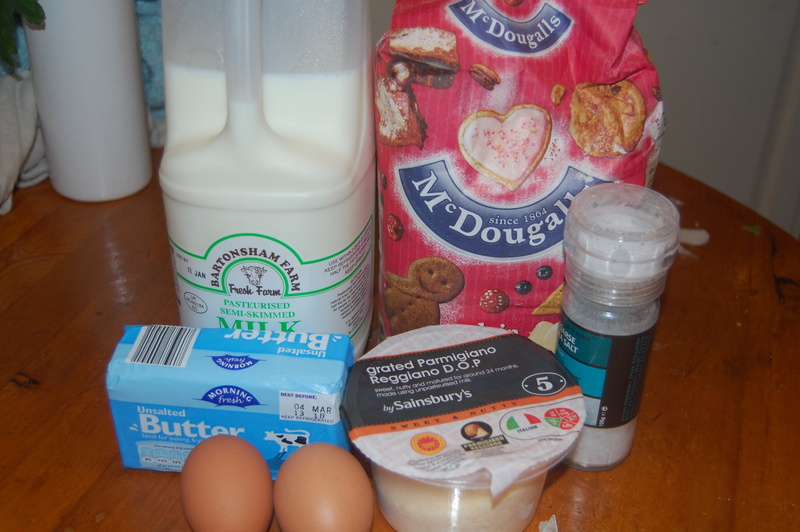 So naturally I wanted to make this – a recipe that contains not one but four cheeses. Upon searching, Fontina Cheese was not to be found. I was however recommended to use Edam as a substitute. So I did. 1. Peel and finely chop the onion. Cut the Gorgonzola and Fontina into small cubes. In a saucepan bring the stock to the boil. Cover and keep warm. 2. 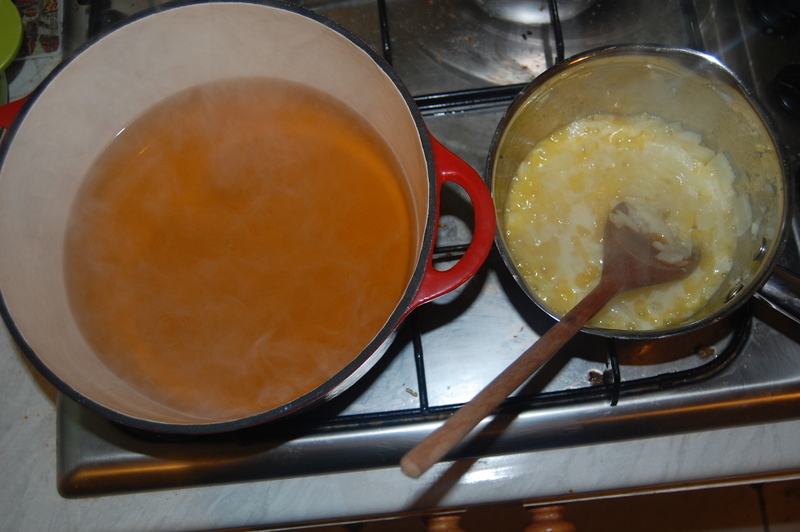 In a stock pot melt 4 tbsp of butter. Sauté the onions for 4 minutes until soft. 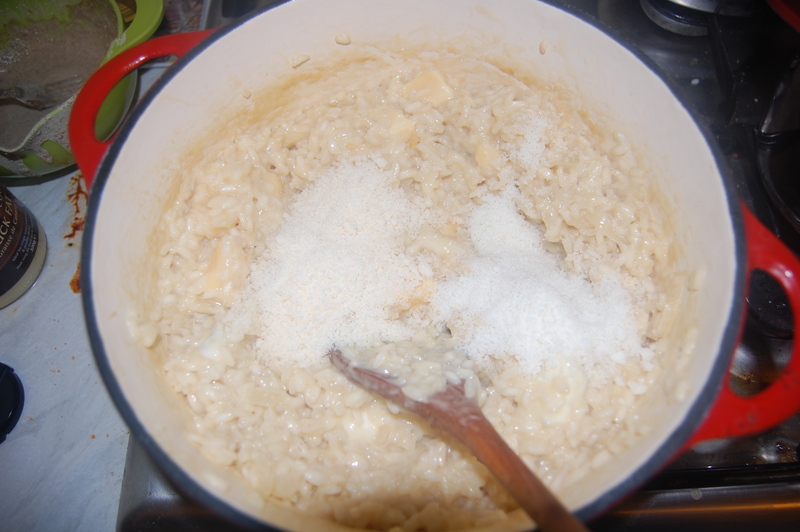 Add the rice and cover with the butter. Sauté until translucent, for 1-2 minutes. 3. 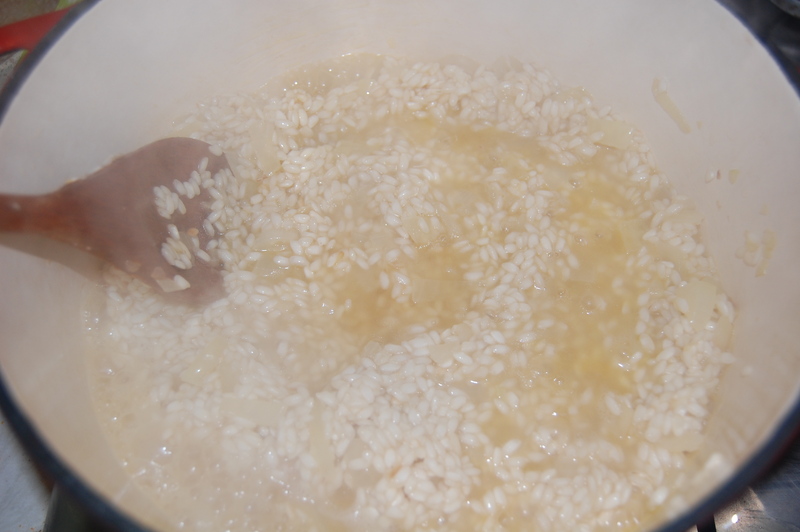 Add the stock, 1/2 a cup at a time allowing the rice to absorb the liquid fully before adding any more. Stir continuously. 4. Continue to cook until rice is creamy and tender, this should take 20-25 minutes. 5. Remove from the heat. 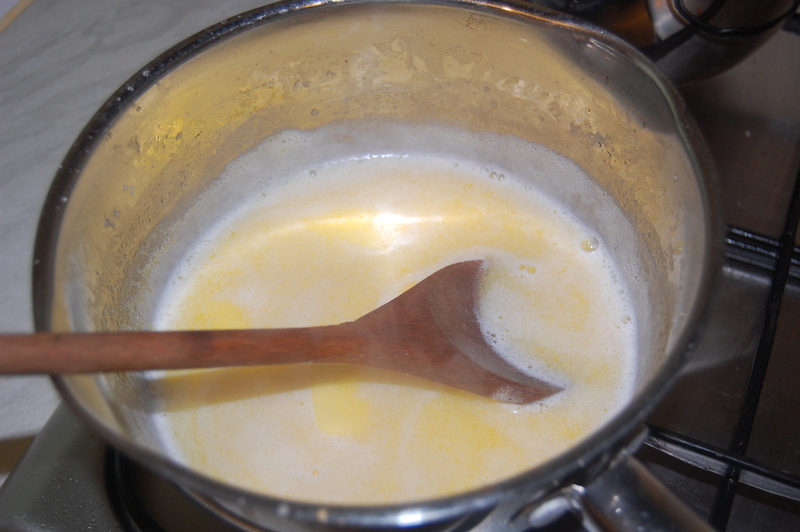 Stir in the remaining butter and add the cheeses. 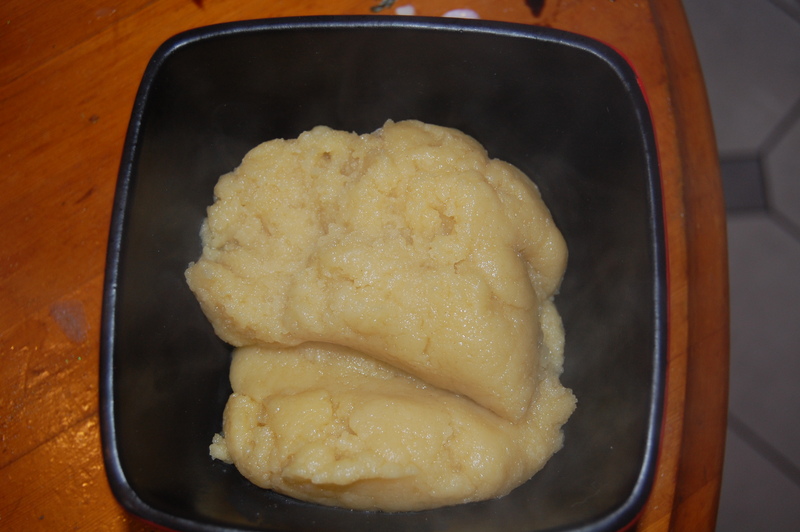 Stir until fully melted. Season with the black pepper and serve straight away. The risotto smells beautiful. The continuous stirring was a pain, I’m much more of a stick it in and leave it alone cook. I’m learning. The cheese took a lot longer to melt in than I expected too – maybe smaller chunks next time. TASTE – Very cheesy. Who knew Gorgonzola was so strong. COST – Posh cheese came in at around £1.50 a piece. Made loads though. DIFFICULTY – Easy if you remember not to stop stirring.